BSSC Scam: Question Paper Leak in Bihar SSC Inter Level Exam – Complain Bihar SSC against its BSSC Inter level Preliminary exam: As we all know, It’s Bihar and every examination held in Bihar ends up with controversies, scams, involvement of High Court etc. This is why Bihar and Bihar Staff Selection Commission (BSSC) famous for. BSSC Paper Leak: Questions were leaked of both exam on whatsapp much earlier than actual exam began at 11 AM. The Bihar Staff Selection commission has recently conducted BSSC Inter Level Exam on 29th January and 5th February 2017 for appointment of clerks in the state government after almost two & half year of notification. Meanwhile, hundreds of candidates protested outside the headquarters of BSSC in Patna demanding cancellation of the examinations. Similar claims of question paper leak had surfaced during BSSC’s first-phase examinations on 29th January, but the authorities had rejected them. After completion of Bihar SSC Graduate Level result, many candidates are complaining about question paper leakage in Bihar SSC Inter Level P.T. exam. Bihar SSC Inter level aspirants are claiming they got answer of all question asked in BSSC Inter Level exam much earlier than actual exam held on 29th January and 5th February 2017. Many candidates were sure about their Bihar Inter Level P.T. result but they are now disappointed after seeing BSSC question paper leakage. According to reports, the questions were leaked on an online chatting platform Whatsapp, much earlier than actual exam began at 11 am on Sunday. The leaked question paper and answers soon went viral on Whatsapp as the exam began. As many as 18.5 lakh candidates to be appeared in the BSSC examinations at 742 centres spread across Bihar on following days. The third and fourth phases of the examinations are scheduled on February 19 and 26 respectively. “There was no leak. All this was a rumour spread by those with vested interests in order to distract and mislead the candidates,” said BSSC secretary Parameshwar Ram. BSSC Scam: Question Paper Leak? Before proceeding into list of Question paper leakage of of BSSC Inter Level exam, we are going to provide you a summary of 1st Inter Level Recruitment. Online Registration: September to October 2014. Look at the gap between recruitment notification and examination, have you seen such gap between any notification and its exam? What BSSC was doing in that span of time? I guess, after seeing the above summary & evidence, one can easily say corruption is being done in Bihar SSC Inter level exam. Why BSSC officials are denying it. Now let’s move to the list of loopholes done by Bihar Staff Selection Commission (BSSC) in 2nd Inter Level Combined Competitive exam 2014. Some of the irregularities happened in BSSC exam are listed below. Download: BSSC Inter Level Exam 29th January Paper. Download: BSSC 5th February Inter Level Question Paper. As you all know, BSSC has prohibited candidates from bringing question paper to home however Question paper is easily available. Where is transparency? Why they are not accepting the hard truth of BSSC Inter Level Exam paper leak? 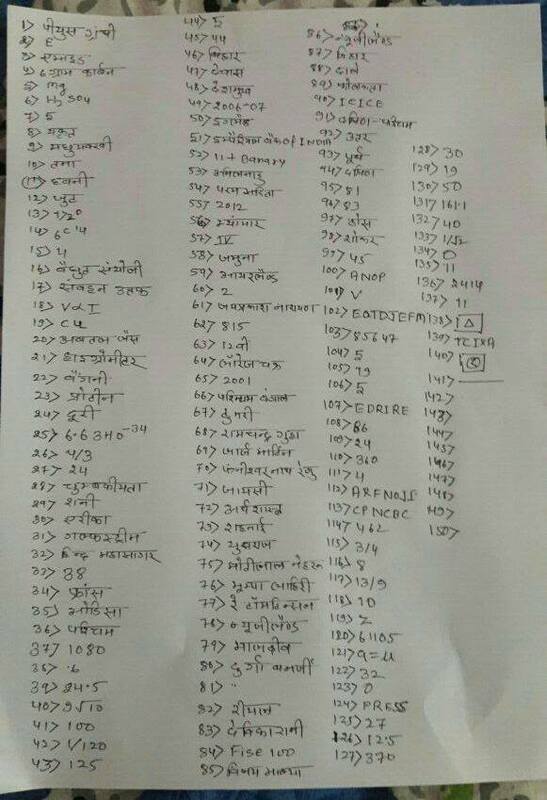 Now, look at the piece of Answer sheet which went viral on whatsapp much earlier than actual exam. Everyone, even I've found this answer of same as BSSC official question paper. Why BSSC has done these? To make their own candidate (You know what I mean) to select in final list. If they had only this intention, why they issued notification for recruitment? Why they accepted application fee? I'm sure, by leakage of BSSC Inter Level Question paper, no genuine candidates will make it to BSSC Inter level mains exam. At the end all I can say, This BSSC Exam is scam, Questions paper were leaked much of Bihar SSC Inter Level P.T. Exam. BSSC officials are involved in corruption. Yet another incident of a cheating scam has surfaced from Bihar, where the question paper for the second phase of the Bihar Staff Selection Commission (BSSC) has allegedly been leaked. One can’t have faith in Bihar Staff Selection Commission (BSSC). They have proved it once again. Similar claims of questions paper leak and corruption had surfaced during BSSC Graduate Level examination, but commission rejected it.